STATEHOOD:In 1620, the Pilgrims, seeking religious freedom, set sail from England and established a colony in Plymouth. After them came the Puritans along with a royal charter allowing the Massachusetts Bay Company to promote settlement of the territory from "sea to sea" and to govern its colonies. This charter became the foundation of government for the Massachusetts Bay Colony. The growth of Massachusetts spread along the coast and then to the west. The colony seemed to be getting along fine on its own while England was preoccupied with their war with France from 1688 to 1760. In 1764, however, the Company's charter was revoked and the colony was placed under the Dominion of England and the administration of Sir Edmond Andros. England attempted to reassert her power over the colony and conflict between the colony and England increased. Massachusetts rebelled and eventually armed conflict broke out. The so-called "Boston Massacre" of March 5, 1770 occurred when British soldiers fired into a crowd of taunting colonials. In response to the Tea Act of 1773, Boston citizens, organized by Sam Adams, disguised themselves as Indians and dumped the cargo of East India Company ships into Boston Harbor in protest. On April 19, 1775, colonials engaged the British at Lexington and Concord and touched off "the shot heard round the world." The Revolutionary War began. The story of Massachusetts' statehood is the story of the birth of the United States. One of the original 13 states, Massachusetts joined the Union when it became the sixth state to ratify the new constitution on February 6, 1788. However, Massachusetts ratified the Constitution only on the condition that certain amendments concerning individual rights be added. These conditions, entered under the "Bill of Rights," went into effect on December 15, 1791. The Massachusetts Constitution was ratified in 1780 while the Revolutionary War was still in progress, nine years before the United States Constitution was adopted. It is the oldest written Constitution now in use in the world. Massachusetts, like Pennsylvania, Virginia, and Kentucky, is called a "Commonwealth". Commonwealths are states, but the reverse is not true. Legally, Massachusetts is a commonwealth because the term is contained in the Constitution. 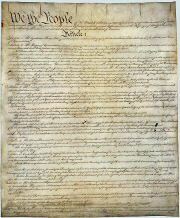 PREAMBLE:The end of the institution, maintenance, and administration of government, is to secure the existence of the body politic, to protect it, and to furnish the individuals who compose it with the power of enjoying in safety and tranquillity their natural rights, and the blessings of life: and whenever these great objects are not obtained, the people have a right to alter the government, and to take measures necessary for their safety, prosperity and happiness. STATE MOTTO:The motto of Massachusetts is attributed to Algernon Sidney, an English soldier and politician. The words were written in the second of two lines he wrote in The Book of Mottoes in the King's Library at Copenhagen, Denmark around 1659. Algernon Sidney's Discourses Concerning Government, originally published in 1698, had some influence on political thinking at the time and may have been particularly favored by some in the American Colonies. His words, written in The Book of Mottoes, were adopted in 1775 as an element of Massachusetts' first colonial seal as the fledgling state began to break ties with England. Today, those words remain as the motto of the Commonwealth. The blue ribbon around the bottom of the shield on the coat of arms reads, Ense petit placidam sub libertate quietem. STATE GOVERNMENT:As in the case of the federal government, Massachusetts' government is organized into three branches, as specified in its constitution - legislative, executive, and judicial. The state government is a product of three documents: the United States Constitution, the Massachusetts Constitution, and laws of the state. The Governor may recommend new policies for Massachusetts, new legislation, and changes in the administration of departments that conduct the government from day to day. He or she has the power to order out the National Guard to meet domestic emergencies and is Massachusetts' chief spokesman with the federal government. The Massachusetts Legislature, called the "Great and General Court," is responsible for making the laws in Massachusetts and for raising and distributing the money necessary to run the state government. The Supreme Judicial Court is the highest court in the Commonwealth; it is empowered to advise the Governor and the Legislature on questions of law. All trials are held in departments and divisions of a Trial Court. A Trial Court hears civil and criminal cases. Cases may be appealed to the Supreme Judicial Court or the Appeals Court for review of law. The Superior Court is the highest department of the Trial Court. Other departments are the District, Housing, Juvenile, Land, and Probate Courts. The capitol is referred to as the State House. Boston architect Peter Bullfinch spent months studying Greek and Roman temples. Then he adapted their forms for this new State House, designed rows of columns, and, most daring of all, planned a large dome. At the very top he placed a gilt pinecone as a symbol of the forests that made it possible for the early settlers to survive. 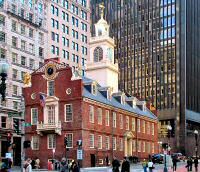 Governor Samuel Adams, assisted by Paul Revere, laid the cornerstone of the new State House on July 4, 1795. Building was placed on a hill in John Hancock's cow pasture -- Beacon Hill. Dome was made of wood and covered in copper by Paul Revere. The dome was first gilded in gold in 1861. Two marble wings, on either side, were added in 1917. During World War II, the dome was painted gray to disguise it as a landmark. The dome has been gilded with 23.5-karat gold leaf twice since 1948. 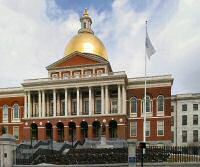 STATE REPRESENTATION:The Massachusetts Legislature, officially referred to as the "Great and General Court," is composed of two bodies, called houses, like the United States Congress. The two parts are the Senate and the House of Representatives. The Legislature is referred to as a bicameral body because it is made up of two houses. The Latin roots of the word bicameral, "bi" and "cameral," mean two chambers or rooms. The General Court, elected every two years, is made up of a Senate of 40 members and a House of Representatives of 160 members. Each branch elects its own leader from its membership. The Senate elects a President and the House elects a Speaker. STATE REPRESENTATIVES:Representatives in Massachusetts each represent people in a specific area of the state. These areas are called house districts. There are currently 160 men and women representing 160 house districts in the Massachusetts House of Representatives. 23 representatives are Republicans and 126 are Democrats. One representative is an Independent. Each representative serves for a period of two years in the House of Representatives, after which he or she must run for re-election. STATE SENATORS:Senators in Massachusetts each represent people in a specific area of the state. These areas are called senate districts. There are currently 40 men and women representing 40 senate districts in the Massachusetts Senate. Seven representatives are Republicans and 33 are Democrats. Each senator serves for a period of two years in the Senate, after which he or she must run for re-election. LEGISLATIVE PROCESS:The legislative branch of government is responsible for making and maintaining laws within their jurisdiction. United States representatives and senators, federal legislators, are responsible for laws at the national level and state legislators are responsible for laws at the state level. 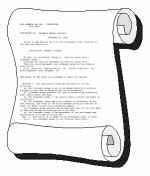 A law begins as an idea that is introduced in the Massachusetts General Court as a bill by one or more legislators. Any citizen of Massachusetts may file a bill through a state legislator. The bill is assigned to a committee, given a public hearing, and reported by the committee to the appropriate chamber with a recommendation to pass or defeat. The bill then goes through the legislative process to become a law. During this process the bill may be changed. Not all bills become law. CURRENT LEGISLATION:The following link will allow you to look at bills that are currently going through the legislative process. 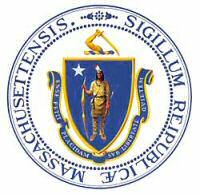 STATUTES:The following link will allow you to look at Massachusetts's current laws. Counties are a local unit of government within a state. All but two of the states are divided into counties. Alaska is divided into boroughs and census districts and Louisiana is divided into parishes where governing responsibilities are similar to counties. Traditionally, counties performed tasks mandated by the state, such as property assessment, property and vital statistic record keeping, maintenance of rural roads, administration of local election and judicial functions, and support of the poor. Today, counties may be responsible for these functions, more or less, but the responsibilities of county governments vary from state to state. The county level of government is not mentioned in the Massachusetts Constitution and has been established by legislative action. 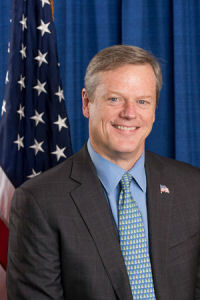 A county governs no area of the Commonwealth and, as is usual in New England, county government is not a strong entity. The largest county is Worcester County at 1,513 square miles. The smallest county is Nantucket County at 48 square miles. Middlesex County is the most populated with 1,465,396 people (2000 census). The least populated county is Nantucket County with 9,520 people (2000 census). U.S. CONGRESSIONAL DELEGATION: The legislative branch of the United States government makes laws for our nation and raises and distributes money to run the United States government. 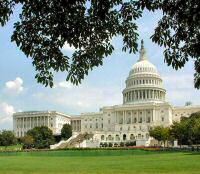 The most evident part of the legislative branch is the United States Congress. Congress is divided into two parts, called houses. The two parts are the Senate and the House of Representatives. Congress is referred to as a bicameral body because it is made up of two houses. The Latin roots of the word bicameral, "bi" and "cameral," mean two chambers or rooms. Members of the Senate are called Senators and members of the House of Representatives are called Representatives or Congressmen or women. Senators and representatives serving in these two bodies are sometimes referred to as legislators because their business is to legislate or make laws. The role of the legislative branch is defined in the United States Constitution. The citizens of Massachusetts elect two people, like every other state, to represent them in the Senate and 10 people, based on Massachusetts' population, to represent them in the House of Representatives.